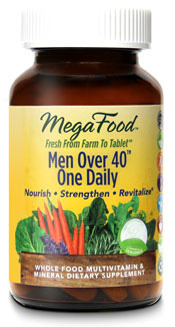 Men Over 40 One Daily Multivitamins, 30 tablets (Mega Food) - Penn Herb Co. Ltd.
Men Over 40™ One Daily is wholesome nourishment in a convenient one tablet daily formula. It nourishes and supports the health of the whole body, and promotes immune health and well-being. One-a-day multivitamin for men over 40.